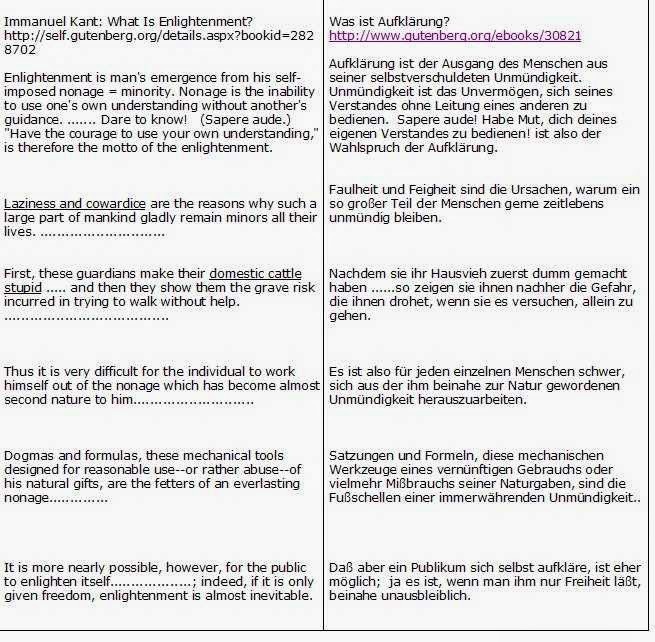 anagasto: Kant: What is Enlightenment ? Kant: What is Enlightenment ? Kant's Critique is a wonderful book, full of great things like an old museum where they had to fire the caretaker because there aren't any visitors anymore. Things have suffered neglect. How could he end up referring to people as “domestic cattle” ? Below is a translation (at Gutenberg in public domain), but I did look up the original German text, and it is just as coarse. Really? Consider the effort it takes, now, for anyone to stay his course in the flood of print. In Kant’s time there was less of that, but, for other reasons, then as now, most people’s formation also depended largely on circumstantial luck. In fact, I had seen an even more shocking thing some years before. The jewel and conclusion of his Critique is his final statement that “in these matters” (religion) nature has given every man the same possibilities of knowledge. Nature as Deus ex maquina! Nature, always so kind, considerate and full of foresight and killing people by the million? “for this trip we did not need the saddle bags”, meaning the result does not justify our exertions, as Kant also had anticipated. Aber auch nur derjenige, der ............................ ein wohldiszipliniertes zahlreiches Heer ..... zur Hand hat, – kann das sagen, was ein Freistaat nicht wagen darf: Räsonniert, soviel ihr wollt, und worüber ihr wollt; nur gehorcht! These are ominous discoveries, and maybe they were not meant the way I have understood them.